The effort by the lame-duck Republican legislature in Michigan to ram through a so-called “right-to-work’ law is a subversion of democracy, pure and simple. What they could not accomplish through the electoral process, these Republicans intend to do with a blatant power play. It should not stand. We should cheer the arrival Tuesday morning of hundreds of thousands of workers in the streets of Lansing to protest this dirty deed. They can help peel back the layers of deceit to show this legislative attack for what it is – payback to unions for helping Obama and other progressives win in November, and a defiant call to arms on behalf of their corporate underwriters, the sponsors of their lost election. 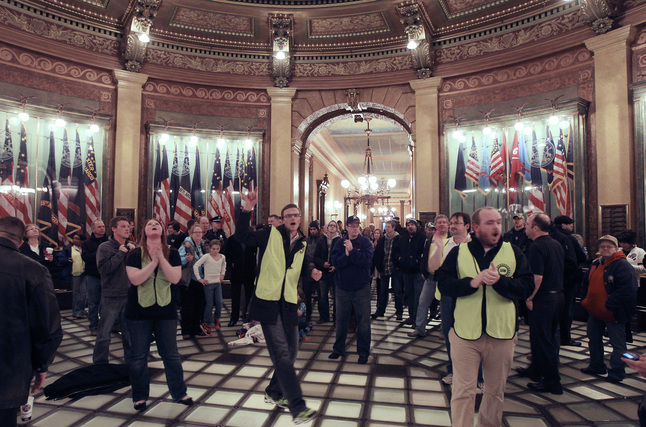 Protestors rally Dec. 6 at the state Capitol in Lansing, Mi., before police turned them back with pepper spray. (AP Photo/Carlos Osorio). Thus far, however, the lesson in Michigan for those who disagree is “Duck!” Tens of thousands of protesters mustered force on Dec. 6, the same day the bill was introduced. They were pepper-sprayed by the police as the state senate held its voting session behind locked doors. No hearing. No discussion. No justice. There have been other modern-day subversions of democracy by state legislatures, such as Pennsylvania’s 1996 lame-duck passage of electric utility deregulation, pushed through by future energy czar Tom Ridge. Wisconsin Gov. Scott Walker’s single-minded assault on public service unions in 2010 certainly qualifies as a major political attack on the public interest. But Michigan’s “right-to-work” scam really takes the cake. Even a superficial look shows the “underhand” behind this attack on unions – the powerful Koch brothers and their moneyed consort, the corporate-sponsored National Right to Work Foundation, and the right-wing ALEC legislative lobby, doing the dirty work on the assembly floors. And this is occurring only a month after Obama soundly defeated Mitt Romney and the same corporate ideal – by 8 points in Michigan, led by an overwhelming 15-point majority among union households. It is comforting to hear, just last week, that Obama opposes “right to work for less.” But we need more of this drumbeat on behalf of simple economic justice. One presidential pronouncement is not enough. It is this kind of fractured logic and double-speak that politicians use when they intend to operate against the interest of the people they should be representing. And because of this easy-to-swallow fabrication a majority of Michiganders – 55 percent – say they are in favor of “right to work.” It’s about freedom, right? No, it’s not. It’s about restricting your rights to organize – your freedom to make something better of your life. As the Detroit Free Press stated in an editorial Dec. 9, “Snyder’s right-to-work legislation is an attempt to institutionalize Republicans’ current political advantage. Everything else is window dressing, and most of these diversionary talking points are demonstrably false. “The argument that right-to-work status makes states more competitive or prosperous is refuted by a mountain of evidence that shows right-to-work states trailing their union-friendly counterparts in key metrics like per capita wealth, poverty rates and health insurance coverage,” the Free Press pointed out. So-called “right-to-work” laws make it illegal for employees and employers to negotiate a contract that requires all employees who benefit to pay their fair share of the costs of negotiating it. These laws are designed to undermine unions’ bargaining strength. If workers are allowed to opt out, collective bargaining doesn’t work so well. Currently, 23 states have such laws, including Indiana, which succumbed to the same one-party ALEC rule earlier this year. That’s the problem with the right-wing “freedom” recipe. It does not give power to the individual. You are free to what? Get along? To be truly free, you must have the right to organize. We don’t have that today, despite the best efforts of FDR to create a National Labor Relations Act in 1935. We do not have this basic freedom of association, to choose a representative in the workplace, because legislators have continually eroded those rights, palms greased with corporate largesse. The NLRA was first sullied in 1947 by the anti-union Taft Hartley Act, which was forced through by another Republican Congress, over the veto of President Harry S Truman. The Taft-Harley Act specifically authorized states to prohibit unions from negotiating “closed shops,” where everyone paid their fair share. Many southern states rushed to outlaw “fair share,” and for years those states have suffered the consequences – lower wages, lower income, more poverty. President Obama may never have to exercise a veto over a National Right to Work Law, which was one of the corporate planks embraced by Mitt Romney in his 2012 campaign, but he will get a chance to weigh in on the subject Monday, Dec. 11, when he visits an auto plant in Michigan. Let’s listen to what he says. I’m hoping for a strong statement against “right to work” and for the right to organize. Perhaps even a call for national card-check legislation, where a majority can rule in the workplace before the company mounts the inevitable anti-union broadside, protected by our weak labor laws. It’s long overdue to swing the ball the other way, to balance the playing field for workers against the powerful corporations that run their lives. That would be the mark of real freedom, the freedom to organize. This entry was posted in Uncategorized and tagged 'right to work', corporate excess, freedom to organize, Koch brothers, Michigan, Obama, Rick Snyder, unions by bymichael2012. Bookmark the permalink.